I held off from reading anything about Goddess before reading the book itself. 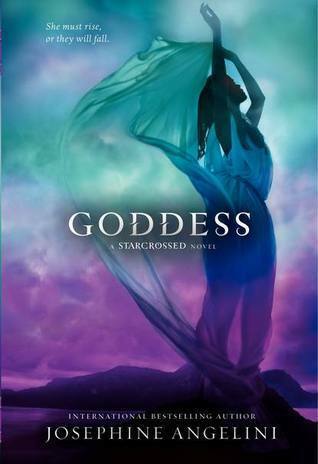 I loved Starcrossed and Dreamless so much that I didn’t want to have anything spoiled for Goddess, whether it was plot points or swayed feelings. I knew absolutely nothing going into reading this final book. I loved it. It was the perfect way to end this series. Everything isn’t perfect, but it’s close enough. People are happy, but the future is still unknown. That is how an ending to a series like this should be. Helen has gone through a lot for her family and friends. She’s faced down evils and traveled into Hades. She’s spent two books learning about herself and the world of gods and now it’s time to put all her knowledge to use. She has to be ready mentally and physically, and I liked that about the book. It doesn’t focus on needing to be the strongest or the smartest, but finding the best balance between the two. Helen has to figure out which battles to fight and which to outsmart. Lucas and Orion. Angelini made me love them both. I felt just as torn as Helen when it comes to these two men. There is nothing that sets one far above the other, but I knew through all three books which way I wanted Helen to go. I think what made me happiest, though, was Angelini didn’t leave it up to fate. She didn’t make it seem as though Helen had to end up with one because the fates made it so. Helen listened to what her heart and mind was saying and made her choice that way, not letting fate decide for her. The entire Starcrossed series has been amazing to read. Angelini created a fantastic world revolving around the Greek gods and goddesses that felt as though it fit in perfectly to the real world. I’ve fallen in love with these characters and am sad to see the end of their story, but I look forward to rereading in the future and falling in love all over again. This entry was posted in Something a Little Different, The Must Reads, Young (and New) Adult and tagged Fantasy, Josephine Angelini, Must Read Series, Must-Reads, Mythology, Paranormal, Supernatural, Young Adult.